Named after its street location, a new gallery called 124 W. Pike St. opened September 15 in Covington in Duveneck Square, listed as an Historic District by the National Register. “I wanted artwork with an edge,” Terrill said. The gallery also carries prints, acrylics and jewelry. She is working with the Development Department of the city of Covington to create an arts district at Duveneck Square. Terrill also wants to host studio classes in conjunction with Covington’s The Point Arc, which serves people with developmental disabilities. She plans to teach drawing, painting, and printmaking. With a B.S. in applied arts, Terrill has worked as an art teacher in Ohio, South Carolina, Tennessee, Texas and Puerto Rico. “Whether studying art or teaching art, I believe that art is a passion that comes from within,” she said. “When words fail, paint!” Terrill paints in oil and acrylic, and draws. Terrill’s career included selling art at The Closson Art Gallery and at Malton Art Gallery. She owned and managed her own gallery, Suzanna Terrill Gallery, in Over the Rhine from 1998 to 2004. Her community activities include serving as a member of the Resident Arts and Humanities Consortium and supervisor of Creative Art Classes for Children at the Cincinnati Art Museum. In 2004, she returned to Tennessee and began painting again. Terrill also worked with Ethan Becker, grandson of Joy of Cooking author Irma S. Rombauer, helping with the 75th edition of Joy. 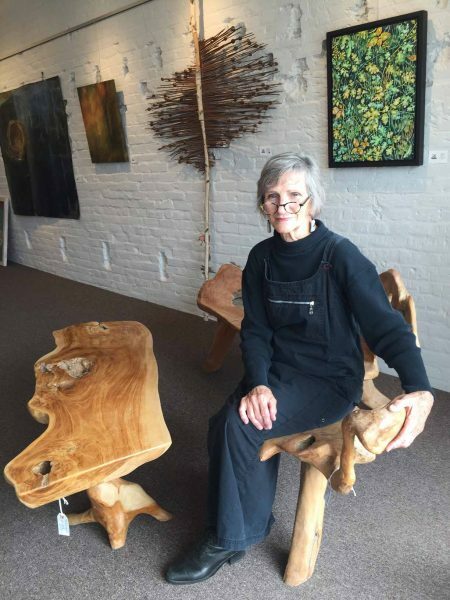 Three years later, she became involved with the Townsend Artisan Guild with its mission to connect fine arts and crafts through education of youth and adults, professional development of local artisans and community development. Today, the Guild sponsors the Smoky Mountain Fiber Arts Festival in Townsend, Tennessee. She came back to the Greater Cincinnati area because her sister was ill. As of September 1, she had just been here three months. Ramesh Malhotra, owner of 124 West Pike St. Gallery, asked Terrill to come aboard as gallery manager and curator. She hesitated because she had been out of the art scene in the Greater Cincinnati area for over 15 years. After arriving in Covington, Kentucky, she became more aware of the many changes in the area. Terrill said, “The challenge is upon me, to find new, up and coming artists, multicultural artists, influenced by their culture, making art that visually educates us as we experience their vision. Let’s take a step back and look around. 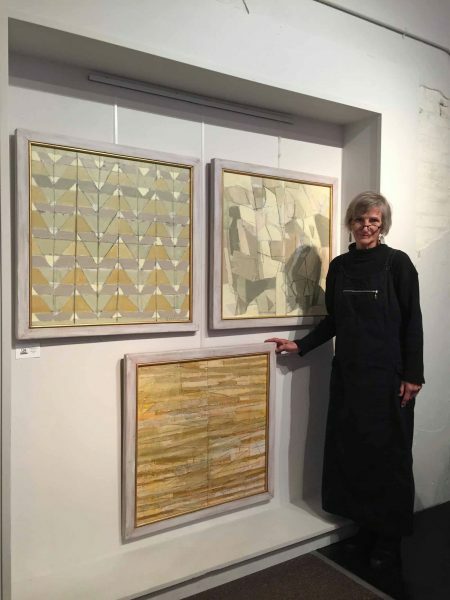 What is happening, what is important in the area, what do artists have to say, what various mediums are they working in today?” She noted the popularity of digital images in addition to traditional art forms. “People have differing economic wants; they purchase a wide variety of goods and services or choose differing amounts of leisure time. My goal is to draw them to the gallery for their education and needs,” said Terrill. She wants to make 124 W. Pike St. Gallery a destination. Next year, Terrill wants to showcase established artists as well as those who are being mentored. She would like to attract designers, business people and architects as customers. She also would like to encourage young people to come into the gallery. Hours are Tuesday through Friday, 11 am – 5 pm; Saturday, 11 am – 4 pm. Special exhibits will be on the third Friday of each month from 5 pm – 9 pm. Phone number is (859) 261-0591. Across the river is another new gallery. 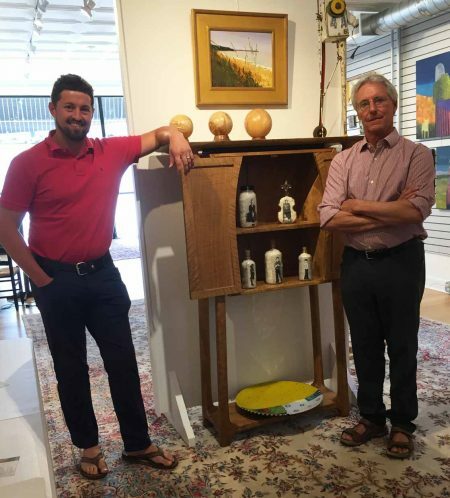 Evan Sikes and his father Reid Sikes have opened a new gallery called Caza (or the hunt in Spanish), located at 3078 Madison Road in Oakley. The owners are hunting for unusual pieces to sell in the gallery. They chose the location of the former Oakley Paint and Glass store, which Reid Sikes has owned for years. They will exhibit fine art and craft and offer appraisals. Both worked at Cowan’s Auction House: Reid Sikes as an operations manager from 2004 to 2017 and Evan Sikes as marketing director from 2010 to 2016. Evan’s grandmother Jane Sikes Hageman was a noted author and collector. She wrote, “The Furniture Makers of Cincinnati: 1790 to 1849” and “Ohio Furniture Makers, Volumes 1 and 2.” Hageman influenced her son and grandson with her extensive knowledge of antiques. When the Sikes decided to open their own business, they renovated the building in 2016. They did their own work, often in the evenings and weekends. “We paid for the renovation out of our pocket,” said Reid Sikes. Buying and selling antiques on the side subsidized the renovation. The Sikes did the floors, walls and painting, among other things. They accomplished their goal not to have any debt when the gallery opened. Both Sikes came to work in the gallery full-time, although Reid has a software business, Fair Warning Software, on the side, which focuses on the auction trade. He added that the gallery wanted a mixture of styles of art. Caza opened September 15 with the exhibit, Riffing van Gogh, which consisted of thirty artists who took Van Gogh paintings and recreated them in their own style. The show runs to September 30. The Sikes accepted five artists from ArtWorks for the show. They will donate a portion of the show’s profits to ArtWorks. 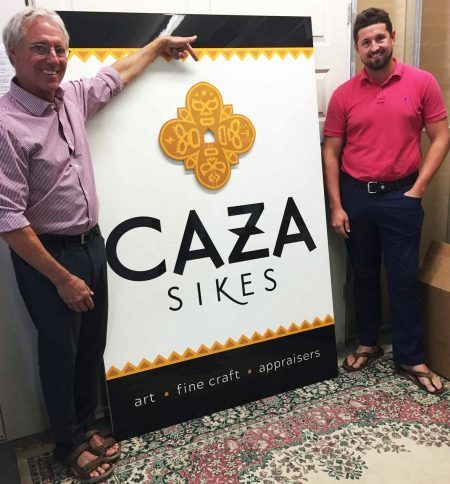 The Sikes are focusing on regional artists primarily in Caza. 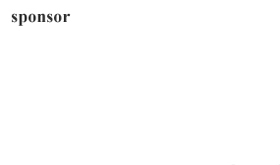 They include Cole Carothers, Suzanne Fisher, Mark and Jan Wiesner, and Rick Koehler. They have a few national artists including Philippe Guillerme, driftwood carver from Waldboro, Maine. In addition, Dewey Blocksma is a folk artist, an emergency room physician who changed his profession to art. His work appears at the Smithsonian Institution, Washington, D.C. and the American Folk and Heritage Gallery, New York City. Upcoming is a 40-year retrospective of Cole Carothers’ paintings which opens November 6 and closes November 24. Visitors can see four decades of his work, both new and borrowed from area collections on display. 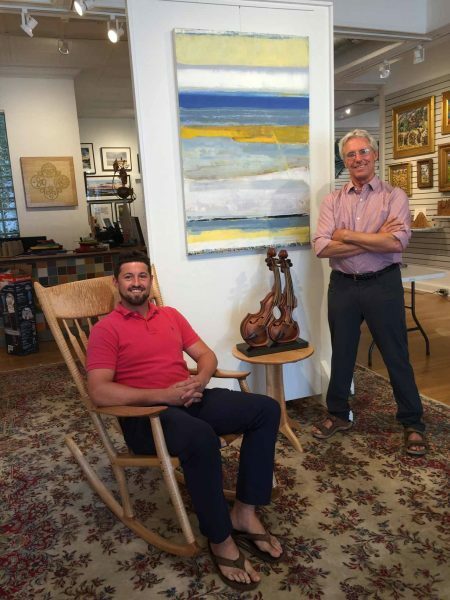 The Sikes want to make the gallery and art approachable to appeal to a younger generation. Since the gallery is new, artists want to know “we’re for real,” according to Reid Sikes. They plan to rotate artists’ work multiple times each month as well as have monthly exhibits. The Sikes look for a fresh, new look all the time. “We don’t want to get bored,” Reid Sikes said. Evan Sikes said that they will partner with local organizations, such as breweries, to host a variety of events. With leisure time spent in Michigan, the Sikes occasionally plan to show artwork from the Leland region. In September 2018, the Sikes plan to do a show that focuses on art for the yard, i.e., garden and porch, with a Southwestern flair. Jan Brown Checco is the organizer leading the effort. 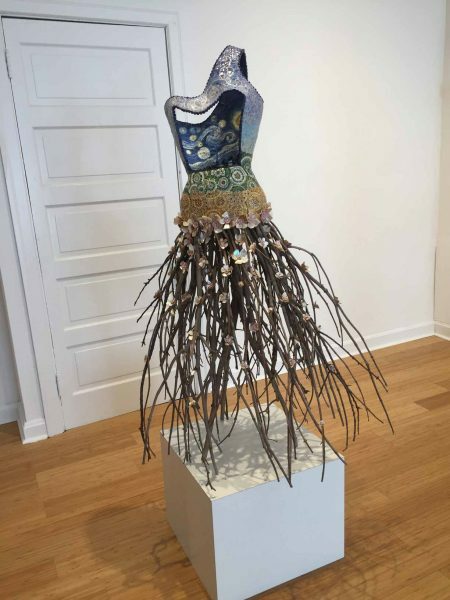 Artists include Karen Heyl, Terri Kern, Kymber Henson and Nancy Hopkins. The show will take place inside the gallery as well as outside under tents. In May 2018, there will be a teaser show in anticipation of the September exhibit. Evan Sikes thinks the city is strong in the arts. “It is a great city for young artists to get started,” he said. He would like to see an art gallery district and sees a need for representing different media, such as fiber, art, ceramics, contemporary work and folk art. “We also want to promote young artists who may have a problem finding a place to display their work,” he said. Evan Sikes will use his marketing skills to promote the gallery. They will include social media and digital marketing with target areas of Hyde Park, Indian Hill, Over-the-Rhine and Wyoming. He noted that Instagram is one of the biggest drivers of art sales.